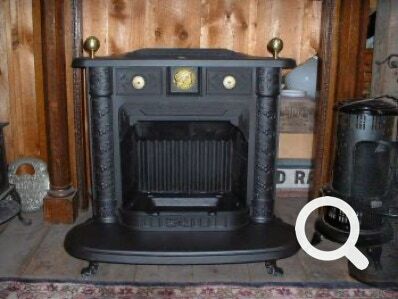 This Franklin stove was made by Wood Bishop Co. in Bangor Maine. It has lovely ornate designs, accented by a beautiful gold tile of a princess and brass cameos and brass balls. It comes with a screen and basket grate. There is nothing like the fire view from a Franklin stove! Circa 1880, this nice Mayflower Franklin stove is in pristine condition, with nice details such as the claw feet and the brass finials. 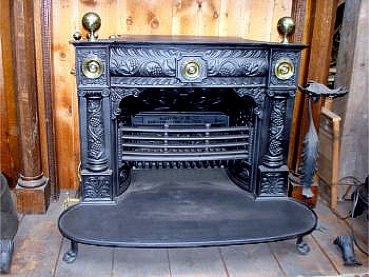 Made by the Barstow Company in Providence, RI, with a nice ornate grapevine motif and nice fire view. Ready to keep you warm this winter. Made by the Orr Painter Company in Reading, PA. Fabulous ornate parlor stove with removable doors, for perfect fire view. Very ornate scrolling and beautiful gold tiles. Brass urn with dragons and storks on the door. A true collector’s prize. 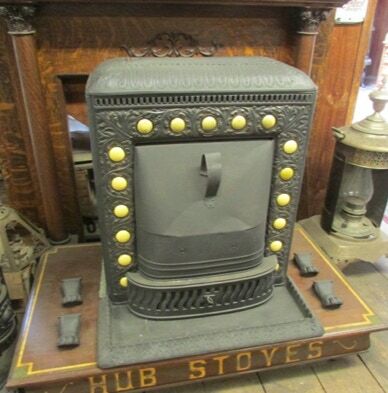 This rare stove from the 1880s burns coal or wood. Mint condition. The side panels, made of tile in Chelsea, MA by the Low Art Co. use cherubs to depict themes of War and Peace. Beautiful fire view stove. Has bulldog feet.